My Civc looks awesome!! I can't believe how a simple HID conversion can totally change the look of a car. The funny thing is that your HID conversion kit is more affordable than the factory option - and it looks 100% better. I look forward to doing future business with you again. Thanks! - New, Never a Demo, Never Refurbished, Never Used. Complete kit; 2 x Very High Output 55 Watt VHO-HID Bulbs, 2 x Very High Output 55 Watt Digital Ballasts and igniters, 2 x harnesses, directions, warranty, free tech support and more! - 1 Year Warranty & Support all Within USA. Our VHO-HID kits provide a great value. Our kits are plug_and_play for a simple installation with no extra parts or modification of any kind needed for most applications. Our kits use the new 7th generation single piece potted digital ballasts with internal ceramic components for better cooling and durability. All of the key components for our electronic ballasts are imported from US, Japan and Germany, for example, our MOS tube and IC are from IR in USA, PIC is also from USA, discharge tube is from EPCOS (SIEMENS) in Germany, electrolytic capacitor is from Rubycon in Japan. The key components play very important role for the ballast reliability. If you ever need a warranty repair it is handled out of the USA and all replacement parts are in stock. Brushed cotton twill, six panel, sandwich bill, relaxed crown, self-fabric strap with metal closure and tuck-in design. Sport the name and show your pride. What is the difference between this VHO-HID kit and another HID kit selling for much less? 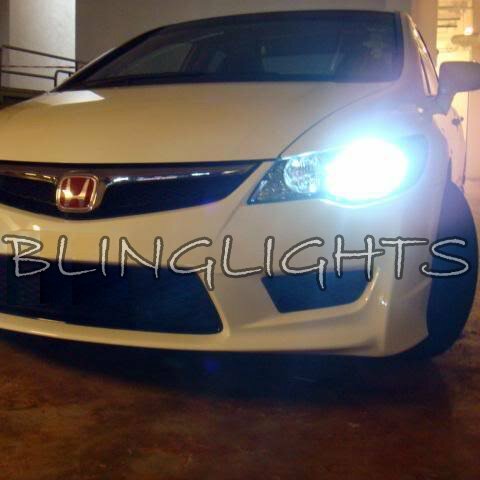 BlingLights Very High Output HIDs are +133% brighter than 35 watt HIDs. Regular HIDs are already 2~3x brighter then halogen and our Very High Output HIDs are an additional +133% brighter than regular HIDs! These are the brightest VHO-HIDs sold anywhere. Does BlingLights carry spare parts if one of the parts were to get damaged in a fender bender? BlingLights has been online since 2001 Replacement parts if needed are in stock at everyday low prices. How come BlingLights does not sell VHO-HID conversion kits in the United States? No xenon VHO-HID conversion kit available from any source is DOT approved regardless of the brand or what the seller claims. Moreover, in the U.S.A., VHO-HID conversions are not street legal for use on public roads. What is BlingLights' 90 day return policy? Every seller should have a return policy and the feedback to prove it is enforced. Our policy is that for whatever reason you decide to return the item you have 90 days to do so from time of delivery. All that is required for a Full Refund less shipping is to send the item back in the EXACT new condition it was received with your order number, email address, and reason for return within the first 2 weeks. After the first 2 weeks but up to 90 days from date of delivery items can be returned for store credit towards any purchase of the same or greater cost only. That is it, no pre-approval needed.